If you are making a bulk purchase for a corporate or government entity, please contact us so that we can assist you and provide you with a quote for your purchase. 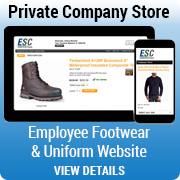 Because we carry a large inventory of protective footwear and safety gear we are able to satisfy bulk orders quickly within 1 - 2 business days. Please note: We are only able to ship our merchandise to locations in the Continental US, Alaska, Hawaii and US Territories.